The Future of Vacuuming is here! NEW self-cleaning hepa standard filter material from the makers of GORE-TEX fabric has been added excuslively to the Beam Serenity Platinum Range. This new Cleanstream filter removes tiny particles at 98% efficiency at 0.03 microns. It is a permanent, automatic, self-cleaning, non-stick filter which sheds dirt and dust without clogging. 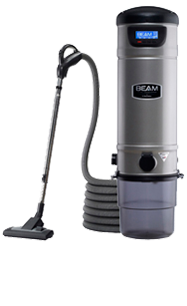 Suction is improved by the Cleanstream filter with the Beam System always operating at maximum efficiency. The Unit also does not require bags - simply twist off the bin and empty!! !